For both ladies and gentlemen, for the complete novice who has never touched a gun, for an experienced shot who would like to enjoy an hours shooting, a competitor who needs some coaching, the Connemara Shooting School at Ballynahinch Castle Hotel will take you through every aspect of safety, gun handling and the methods for breaking all your targets. We can cater for groups of three or more, either business related or families that would like to shoot our driven bird flush. 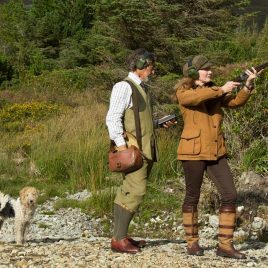 We can provide you with all your needs and can offer a range of suitably lighter, more gentle guns for ladies or younger individuals. Chief instructor Shane Bisgood was trained by the renowned Holland & Holland Shooting School in West London. He has taught both ladies and gentlemen up to International and Olympic standard. For first time shooting enthusiasts wishing to license a gun in Ireland, Shane is authorised to provide the ‘Safety Courses’ as required by the Garda Siochana and will certify the individual upon completion of the 2 hour course.